users of Adam P. Goucher's Catagolue website. a. Display sample soups in a pop-up for easy copying/pasting. b. Add links to the hauls containing the sample soups. c. Encode object in RLE format for easy copying/pasting. d. Encode object in SOF format for easy searching on Pentadecathlon.com. e. Add breadcrumbs navigation links. f. Add LifeWiki/Life forum/Google search links. g. Add links to SVG images. i. Always display apgcode, even for named objects. l. Add RLE comments to sample soups. b. Align numbers and add separators. a. Keep overly long rulestrings from breaking page layout. b. Convert unordered lists to ordered. b. Display sample soups in a pop-up for easy copying/pasting. d. Align numbers and add separators. a. Add breadcrumbs navigation links. b. Indicate rule/symmetry/prefix/offset in page title/heading. 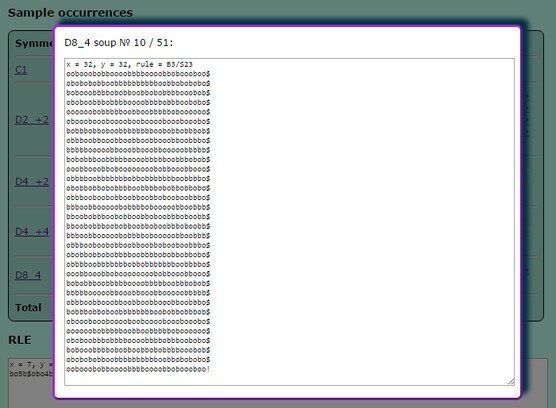 c. Display average objects/soup and soups/haul in intro paragraph. d. Highlight "official" symmetries on rule overview pages. Further enhancements may be added in future versions. 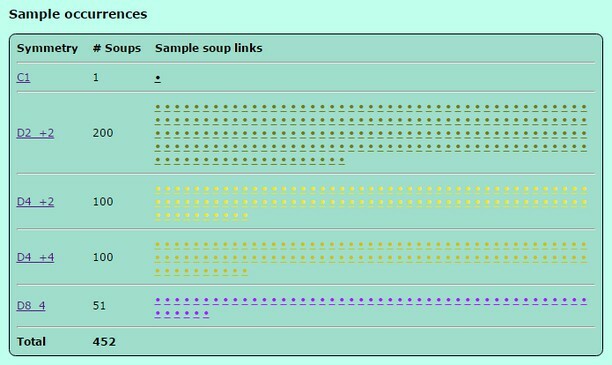 a. Organize sample soup links by soup symmetry.